Tension in a restaurant labor dispute grows as both sides dig in their heels. The protest held in front of Izakaya Fu-Ga in Little Tokyo on Sept. 3 was the latest and most public salvo in an impasse that has grown increasingly divisive in recent months. The Restaurant Opportunities Center of Los Angeles said some 90 restaurant workers and community supporters took part in the march, held during a typical mid-week lunchtime. On July 14, a preliminary settlement hearing was held after 13 current and former Fu-Ga employees filed a claim with the State Labor Commission. Their complaint seeks reparations for unpaid wages, misappropriated tips and failing to provide meal and rest breaks at the popular subterranean bar and restaurant. Kathy Hoang is the director of the ROC, a non-profit organization that seeks improvements in pay and labor conditions for restaurant workers. She told The Rafu that her group is part of a movement to pass a city law to deter wage theft by employers and to assist workers subjected to retaliation. Fu-Ga manager Mamoru Tokuda was eagerly candid to discuss the claims by the plaintiff group, and said the restaurant can document all wages, breaks and staff contracts to show there has been no malicious intent or behavior on the part of the management. He said by law, the restaurant can be fined if staff are not allowed to take mandated breaks, but that several of the current plaintiffs either refused breaks or took them while still on the clock. 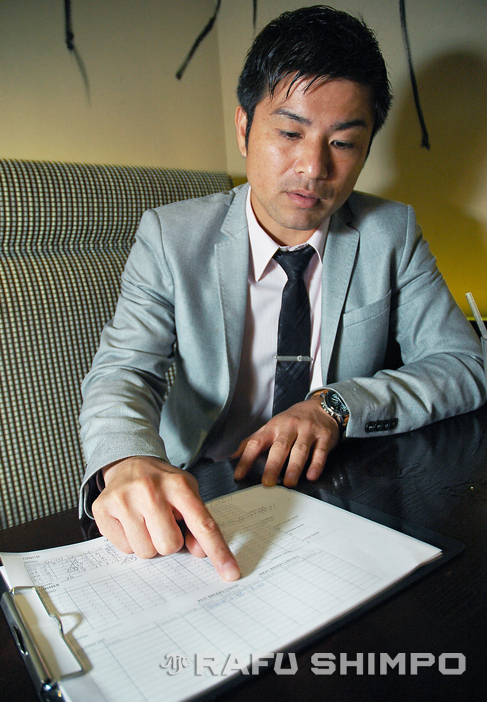 Tokuda explained that employees are expected to stagger their breaks during a given shift, to ensure there are no lapses in customer service. He showed one of the forms used by Fu-Ga to log employee breaks, to demonstrate how the rest periods are managed, and said the restaurant records support the company’s adherence to labor statutes. Former Fu-Ga server Lynn See said the key issues that led to the claim filing is the temperature inside the kitchen in addition to wage discrepancies. Tokuda said new ventilation fans have been installed in the kitchen, even leading the interview for this story into the cooking area to demonstrate the comfort level there. He also wondered why See, who was still working at Fu-Ga when the claim was filed with the state, would take such action if she felt so disrespected. “We started talking about this last December,” See explained. “We were questioning if we were expected not to take breaks or to work off the clock.” She added that the plaintiffs include kitchen staff, servers and an assistant manager. The back-and-forth accusations have taken some unsavory turns as well, with lawsuits, restraining orders and reports of intimidation coming from both sides. Keila Nakasaka, an attorney representing Fu-Ga in this matter, insisted the claim made by the workers are not only invalid, but that they are fueled by outside groups looking to further their own agendas. Tokuda also said that he has been “interrogated” by representatives of Asian Americans Advancing Justice, which has been handling the legal side of the workers’ litigation. A representative from AAAJ refuted the charge, saying no one from his agency has had any direct contact with Tokuda. See said rather than properly address staff concerns, Fu-Ga filed a lawsuit that claimed she and another former employee had sought to extort the restaurant by bringing wage and retaliation claims with the Labor Commission, and that their actions defamed the restaurant. John Trang of AAAJ said his group has additional concerns over falsification of time records on the part of the restaurant. “We wouldn’t bring these claims for no reason,” Trang said. According to ROC, a petition to obtain civil harassment restraining orders against three current and former employees and two community advocates filed last month by Tokuda was denied. The next hearing before the state commission has not yet been set, while Fu-Ga’s suit against See will be heard in October. Despite the rancor and legal maneuverings, however, there appears to be some willingness on both sides to reach an amicable solution. Hoang cited Fu-Ga owner Bruce Kanenobu’s plans for a new restaurant in Palm Desert, and said she hopes the current issues can be mediated beforehand. Tokuda echoed that sentiment, saying he has always considered the team at Fu-Ga as family.